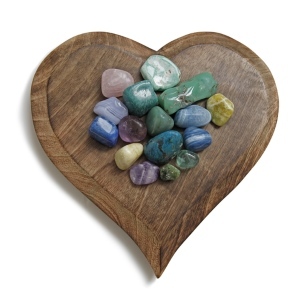 Getting back to nature and writing down your feelings can unblock your heart chakra. If your heart chakra has become blocked, you might find it difficult to form and sustain relationships. According to medical intuitive Christopher Stewart, chakras (Sanskrit for wheel) are "center[s] for various energies to be transformed and linked in your body." The heart chakra is perhaps the most powerful of them all. A blocked heart chakra often results from repressed emotion. Instead of processing your feelings and dealing with them, you might pretend they don't even exist. If you want to remove the blockage, yogini Taylor Alexis Smith recommends writing down your feelings as they occur to you. Honor them so you can move beyond the pain. Returning to nature can help you clear a blockage in your heart chakra and remind you of the gift of the natural world. Take a walk through a local park or visit a wildlife refuge. Sometimes you need another ear to help you unblock your heart chakra. An experienced phone psychic can help you move past the emotions that you've repressed and provide you with guidance on reconnecting with the people you love. If you're uncomfortable chatting on the phone, an online psychic might make you feel more comfortable. Another strategy lies in your attitude toward others. When you're generous with other people, you'll find it easier to be generous with yourself. Performing random acts of kindness can help unblock your heart chakra and remind you of your connection with others. Every morning when you wake up, write down one thing for which you're grateful. This simple gratitude practice helps you see beyond the negativity. You'll feel your heart chakra open up as a result. You can also tell the people you love why you are grateful for them. Your chakra might be blocked because you're holding on to anger, betrayal, or disappointment. If you forgive a loved one for a past transgression, you'll feel lighter and fuller. Releasing those negative emotions opens up your heart to other possibilities. It's also important to treat yourself with respect and kindness. Start paying attention to what your body needs. If you haven't gotten much exercise lately, consider attending a yoga class or swimming laps at the neighborhood pool. If you're working too hard, force yourself to take a break and indulge in a hobby or leisurely pleasure. A few minutes of quiet meditation can help open your heart chakra. Allow yourself to feel emotions as they come to you. Deep breathing can help you feel centered and in control, so use your breath as a way to focus your thoughts and energy during each meditation session. It can be difficult to unblock your heart chakra if you aren't 100 percent committed to your goal. Keep in mind that an open heart leaves you open to new experiences and relationships. Unless you remove the blockage first, however, you risk missing out on all the experiences you might have with the people you love.